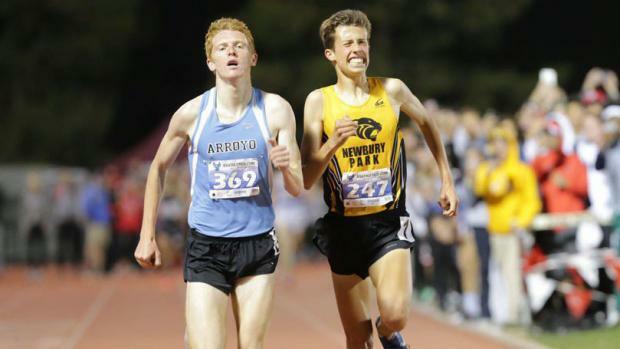 AZUSA, CALIFORNIA -- A week after witnessing a handful of the top distance performances in the country on the track at the Dublin Distance Fiesta, Saturday night's Arroyo HS/APU Meet of Champions Distance Classic provided more of the same. When high school track distance running is the topic, marks set on the fast oval at Azusa Pacific University is a significant part of the conversation. Saturday's near-14-hour meet set and then broke the national best in the girls 1600 meters, set a national best in the girls mile in the same race, and walloped the national standard in the boys 1600 and mile. 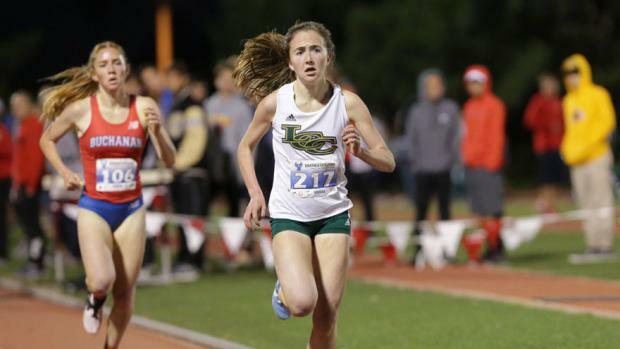 A pair of Foot Locker National Cross Country finalists stole the show, as La Costa Canyon's Kristin Fahy and Arroyo's Noah Hibbard rose above stellar fields to win what was billed as the Jim Ryun "Watch List" Invitational Mile. The race was timed for both 1600 meters and the mile and both seniors put up U.S. No. 1 performances. Fahy clocked 4:49.98 for the mile (4:48.34 for 1600m) and she needed to dig down late after Buchanan senior Meagen Lowe pulled even on the final lap. Lowe wasn't able to counter Fahy's final kick (an announced 70-second final lap) and came in a 4:51.01 (4:49.14). Granada Hills Charter freshman Sofia Abrego -- the previous U.S. leader in the mile at 5:07.82 -- was third in 4:53.55 (4:51.88). The top 10 girls in the U.S. rankings for the mile came out of that one race. Kelli Hines was fourth (4:54.38/4:52.68) followed by Nia Lamas (4:59/50/4:57.74), Fiona Hawkins (5:00.54/4:58.77), Corie Smith (5:03.85/5:01.86), Charlotte Tomkinson (5:03.87/5:02.00), Isabella Landry (5:06.54/5:04.57) and Emma Hadley (5:07.78/5:06.08). Whereas Fahy took charge early in the girls race, Hibbard saw Newbury Park junior star Nico Young charge to the front early and attempt to gap the field. Hibbard would have no part of it, sticking with Young's every move until it was time for a move of his own. Young wasn't easily dismissed and challenged back until it came down to a desperate sprint to the finish that Hibbard won, crossing in 4:08.69 for the mile (4:07.25) with Young just behind in 4:08.82 (4:07.33). Hibbard's closing lap was announced as 61.4. Dana Hills' Cole Stark was third in 4:17.19 (4:15.65) as the top 11 times in the U.S. for the mile were set in that race. 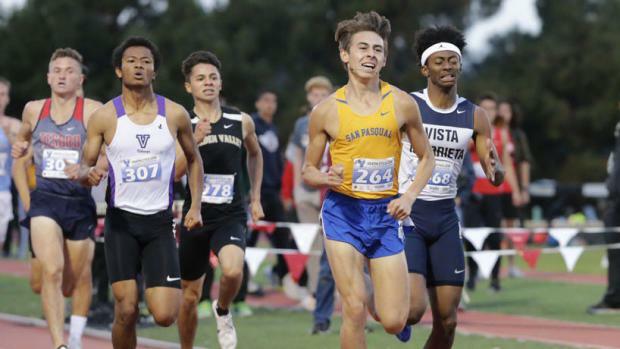 Jesuit junior Matt Strangio, who ran a national-leading 8:47.97 for 3200m last week at Dublin, had shared the U.S. lead for 1600m at 4:14.45 before both Hibbard and Young relegated it to third best in CA. And the U.S. Earlier in the day, Great Oak's Fatima Cortes, clearly healed from a fall foot injury, cranked a 4:51.33 for 1600 to win the "Invitational Double", a late-afternoon elite race for runners looking to double back later in the evening. Cortes' time vaulted to the national lead. But didn't even survive the night once Fahy took the track. She and Lowe both ran faster for 1600 and Abrego just missed surpassing Cortes' time. 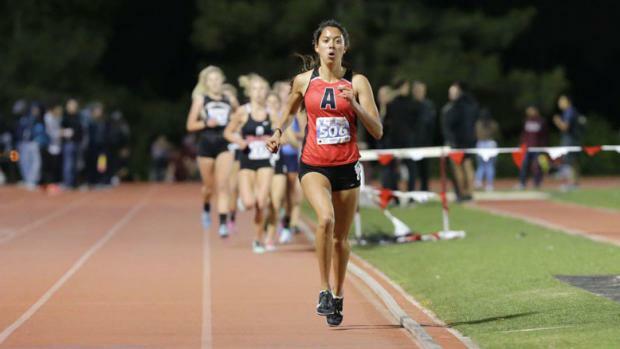 In the invitational 3200s to conclude the meet, Ayala senior Mikaela Ramirez held off a late push from Village Christian sophomore Mia Barnett to win in 10:19.42, a 13-second improvement on her previous state-leading season best and a six-plus-second improvement on her previous PR. That time slots U.S. No. 2. Barnett was second in 10:22.51 (U.S. No. 3) and five others checked in under 10:40, which slot top 20 U.S.: Oak Park senior Sarah Shulze (10:30.41), Mayfield sophomore Audrey Suarez (10:33.46), San Clemente junior Hana Catsimanes (10:34.80), Walnut senior Chloe Arriaga (10:35.53) and Capistrano Valley junior Carly Corsinita (10:38.31). San Pasqual's Noah Tellez-Velazquez came on late from the outside to win the boys invitational 800 in 1:52.52. In the fastest 800 race in the country this season, Tellez-Velazquez's time ranks CA No. 1 and U.S. No. 3. Only four runners in the U.S. had gone under 1:54 before six did it in this one race Saturday night at APU. Vista Murrieta's Willie Coleman was second (1:53.19) followed by Valencia's Kai Wingo (1:53.35), South Pasadena's Kai Dettman (1:53.61), Tesoro's Daniel White (1:53.67), and Golden Valley sophomore Antonio Abrego (1:53.76). 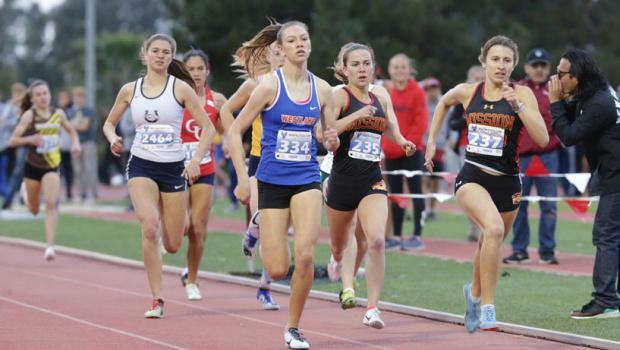 In the girls 800, winner Hailey Golman of Westlake won in a kick-finish to edge Mission Viejo junior Ashley Johnson. Golman's 2:12.62 slots CA No. 3 and U.S. No. 13. Johnson (2:12.77) ranks CA No. 4 and U.S. No. 14. Tomkinson's 2:10.61 from Dublin remains CA No. 1 and U.S. No. 5 with Dublin runner-up Rayna Stanziano's 2:11.22 at Nos. 2 and 8. Hailey Golman (334) won the sprint with Ashley Johnson (237) and the rest of the field in the girls 800.